When Will The Balance Sheet Recession End? Despite the seemingly strong activity in the economy in recent months there is trouble lurking beneath the surface. Don’t get me wrong – we have a real recovery on our hands (see here), however, it remains fragile and largely driven by government intervention. Beneath the surface the balance sheet recession lurks. As the housing bubble grew the US economy experienced an unprecedented growth in debt. 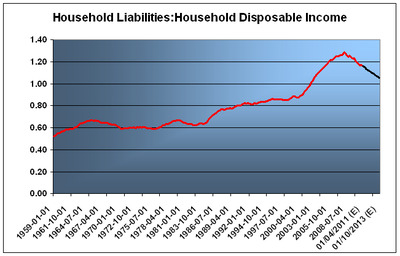 This generated an imbalance as debt levels far outstripped disposable income. This environment was sustainable as long as asset prices continued to climb, however, once prices deteriorated debtors were left with an imbalance. As a result, a balance sheet recession ensued as demand collapsed under the weight of households who preferred to pay down debts rather than spend. The impact is magnified by corporations that cut costs (read, fire workers) as demand collapses and they attempt to protect margins. Real sustainable recovery cannot ensue until the indebted sector of the economy returns their balance sheet to a state of normalcy. The bright side is that things could have been much worse. Even better, we haven’t fallen for the fear mongering from the hyperinflation/USA is bankrupt crowd who are helping to cause so much destruction in the nations of Austeria. The problem is that this government intervention is not a cure. Aggregate household debt levels are still too high as evidenced by the debt:disposable income levels (see figure 2). This means we could still be several years from sustained private sector growth. As I like to say, the public sector is not yet ready to pass the baton to the private sector. At the current trajectory it’s not unreasonable to assume that the balance sheet recession will last well into 2012 and potentially longer. While a 1:1 ratio is “sustainable” by my estimates, it would be comforting to see levels closer to the historical levels in the 80% range. If that is the case we could see the impact of the balance sheet recession persist far longer than anyone believes. The obvious upside risk is a dramatic improvement in the labour market. On the other hand, our government is now explicitly encouraging fiscal imprudence in an attempt to “keep asset prices higher than they otherwise would be”. This sort of policy has the very real potential to increase instability. Other exogenous risks (Europe, China, housing prices, etc) also pose substantial risks to the downside. For now, I think it’s safe to assume that the recovery will remain fairly fragile well into 2012, but given the size of the deficit and potential for labour market improvement we could see continued economic strength. In sum, it’s clear that government intervention has been sufficient to defer the negative effects of the balance sheet recession. In the near-term, that is a net positive, however, the risks are substantial. 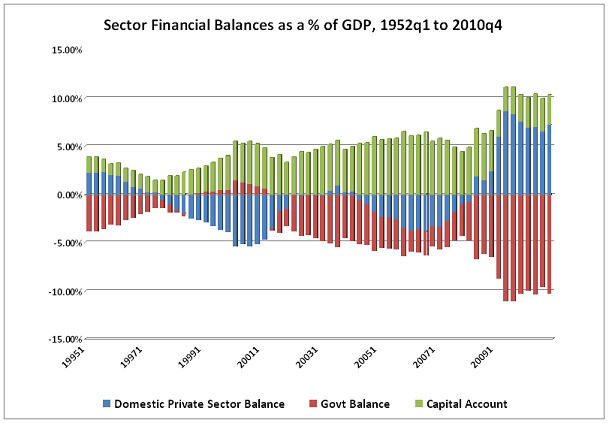 If the balance sheet recession persists into 2013 or longer then the obvious risk is a substantial decline in the deficit. 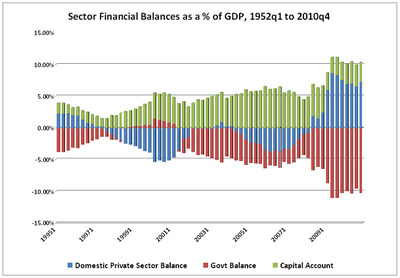 Austerity would almost certainly expose an overly indebted household sector and send the economy back into a tailspin. With the deficit projected to be $1.5T this year it’s comforting to know that we are not repeating the mistakes of Japan, however, it’s important that we not get too complacent as the balance sheet recession lurks underneath a seemingly rosy surface.